Our best pricing due to decreased labor costs and time required for our drivers. 24/7 refueling capability with either scheduled bulk deliveries or electronically monitored supply volume. Refueling stations allow for propane refueling capability for other applications like heating cylinders, propane-powered vehicles, floor buffers, etc. Complete station management: Northwest can provide all maintenance and upkeep and also train your employees to use it. 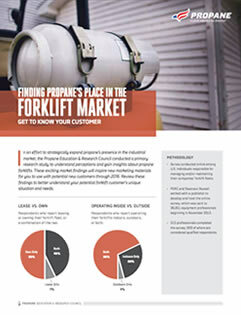 Contact us today at 972-247-6121 or order@northwestpropane.com to learn how our forklift refueling station programs can save you time, money, and hassle. When you are looking for a company that can provide you with a quality forklift refueling station, you want someone who is both reliable and trustworthy. Northwest Propane has an established reputation for excellent customer service and superior products. Don’t put your efficiency in the hands of just anyone. Call Northwest Propane today for a forklift refueling station and see what we can accomplish together! 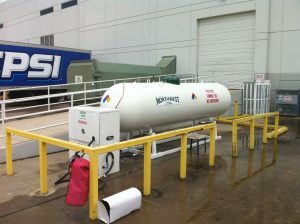 To inquire about a forklift refueling station, Contact or call Northwest Propane today at 972-247-6121. We are happy to assist you.